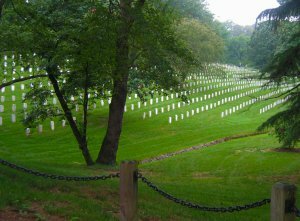 Memorial Day brings up an intriguing idea to ponder: what would the state-of-the-art Memorial Day Celebration be like in a world that had studied death and had concluded that dying was transition, not termination? A compelling reason to study the truth of the near-death experience would be, it seems to me, to ascertain what actually happens in war. We spend vast sums of money on warfare and I think that this is a worthwhile question to be asking. Do we actually kill the enemy or do we unwittingly send their souls somewhere else? The assumption has always been that soldiers die in warfare. The whole point of combat is to kill people. But if death doesn’t truly kill us, we may have a major problem with the whole design of war. Understandably, this may strike you as the ravings of a lunatic. War and patriotism are deeply rooted in just about every civilization in humankind. We’re all brought up on war stories and most of us have played some sort of army game starting in childhood. We’re totally acclimated to warfare. To suggest that soldiers don’t die, especially when most of us know at least one soldier killed in combat, seems absurd. Yet among near-death experiencers (NDErs) are combat veterans, some whose NDEs occurred during wartime. They came to realize that there’s more to death than lights out. They know that the demise of their bodies does not mean the end of everything. Others may counter with the common objection that since these soldiers actually did not die, they cannot know for sure what “death” is like, but the NDEr-soldier is certain what he or she experienced. At the very least I think there is enough circumstantial evidence (just look at YouTube videos) to raise this as a legitimate question: does death truly kill us? And if it doesn’t, should governments be “killing” people? If it were ever proven that death is transition, not termination, then the best we could be saying about warfare is that we send the souls of enemy combatants to another dimension. If that were true, would we be so eager to do it, not knowing the consequences of transplanting these souls? Would selling war be so easy if we had to argue that we’re just moving souls to another dimension? Would we consider what kind of cosmic organization awaited dead soldiers. Do we walk through death and start fighting each other all over again, spreading the hatred to other parts of the universe? Or is death so shocking in a positive way that we instantly see the futility of war—that all warfare does is cause human misery? I sincerely doubt that people in political power will come anywhere near addressing this question. War is profitable. It makes money. It boosts the economy. Some people get rich on the vast suffering of others. But we live in a rapidly changing world. Near-death experiences and after death communication are being taken more seriously as word of them proliferates through social media. War may be a tougher sell to the people in a more spiritually enlightened society who want more justification for all the evil war brings. While I have no love of war, I have nothing but respect for those who have served their country. It’s amazing when people put themselves on the line like that, even when their government orders them to do it. I appreciate that I live in a free country and am the beneficiary of those who have fought for our collective freedom. If it were ever proven that death is transition, not termination, humankind might evolve to a different mode of problem-solving, and that is my point, my hope. We might become more conscious of what we’re doing, and what we’re asking (or ordering) our young adults to do. If I had a wish for a heroic United States of America, it would be that we thoroughly researched the nature of death, and from that research, we decided to employ other options than the killing fields. Memorial Day could become Transition Day and mark the evolution of human consciousness. Maybe it would even mark the dawn of a new kind of soldier, soldiers of love. I know that warfare is a hugely complex topic, and I am spewing off opinions from the comfort of home. Still, with the ever-mounting anecdotal and circumstantial evidence that death does not kill us, I think we should be asking why we keep fighting within the old paradigms of killing. I would much prefer to celebrate a holiday when we honor that humankind rose above warfare and found better solutions to coping with our differences.